Microsoft founder Bill Gates pioneered personal computing, launched the Windows operating system and introduced Word, Excel and other ubiquitous applications. Yet his greatest contribution to humanity could be a toilet. Through the Bill & Melinda Gates Foundation, Gates has spent billions to combat diseases such as malaria, polio and HIV. A pressing concern is sanitation: more than two billion people lack access to basic sanitation facilities such as sinks, toilets and sewers, aiding the spread of diseases such as cholera and dysentery that kill nearly 500,000 children under the age of five each year. Therefore, his foundation has invested $200 million in developing sanitation solutions over the past seven years. Holding a jar of human faeces at the Reinvented Toilet Expo in China, Gates showcased 20 sanitation products that can destroy harmful bacteria and prevent disease, and pledged another $200 million to support further research and market development. In towns and cities across the developing world, waste sits untreated in sewers, leaks out of latrines and contaminates groundwater around people’s homes, or locals collect it manually and dump it in nearby fields and lakes – a recipe for disease outbreaks. The key challenge is to safely treat the growing volume of waste spewing out of mushrooming urban areas, without relying on running water, continuous electricity or sewer infrastructure. Gates’ proposed solution is the Omni-Processor - a small, self-powered treatment plant that kills pathogens in human waste then converts it into clean water, electricity and fertiliser. He also unveiled the Reinvented Toilet, a waterless, self-contained toilet that uses chemicals to turn waste into clean water and solids that can be used as fertiliser or safely disposed. The foundation’s partners are now exploring ways to combat bad smells, handle sanitary towels and integrate solar panels to power their technology. Revolutionising sanitation on a global scale presents commercial opportunities and poses barriers. Reinvented toilets will be a $6 billion market, Gates predicts, and generate more than $200 billion in savings by cutting health costs and reducing sick days and lost wages. However, it could be another decade before reinvented toilets are widely available – Gates plans to roll them out in schools, apartment buildings and other communal areas to start. 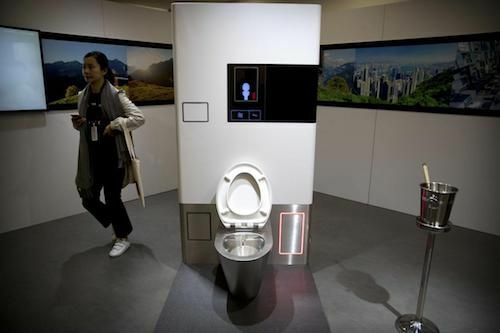 The Omni-Processor and Reinvented Toilet will also have to be small, light and robust enough to be transported to all corners of the world; simple to use, repair and refill with chemicals; and cheap enough for mass production. Gates created one of the most influential technology companies in history, shrunk mainframes into desktop computers and introduced myriad applications, dramatically improving productivity, connectivity and access to information around the world. But the Reinvented Toilet promises to be the lynchpin in his efforts to eradicate diseases and lift billions out of poverty. In a hundred years’ time, the computer whiz might be better known for cleaning whiz.